Every applicant wants to pursue higher management studies from the top Business School , but with the availability of so many business schools in Greater Noida, it has become a tedious task. You have to mull over a number of different factors before you finalize your decision. Even after scoring well and getting calls from various colleges, students remaining confused on which business school to select. 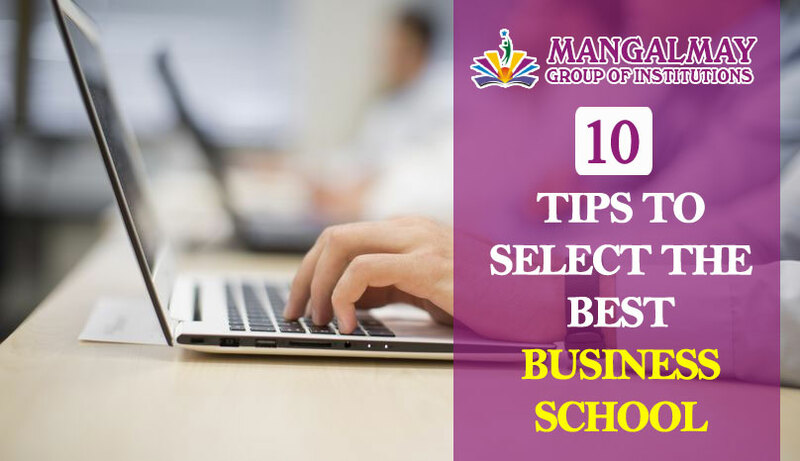 Hence we have compiled a list of the most crucial factors to consider while applying to a business school. A suitable location of your business school is vital. You have to spend the next two years of your life at this place, so you must check if it is close to your home or your family. The personal network that you will be able to make in these two years will also depend majorly on your location as you will spend all your time here and will meet people in that city or town. These relationships will play a significant role when it comes to getting a job of your choice or in your ideal company. The ranking of B-schools is the foremost factor to consider while choosing your MBA College. Rankings are based on facts and figures and show the history and trends of the business schools. The ranking of your B-school will matter a lot to your future employers when they will compare your college to other applicants’ colleges and the respective rankings. However, rankings are important if you are a fresher in work field, but for an applicant who has a work experience of 5-8 years, rankings might matter less, as they already have real-world experience to show up on their portfolios. The placement record of your college is one of the most important factors to see before getting admission. Make sure you check the placement trends of the B-school over the years. You can also check other factors such as who are top recruiters of the college? Which MBA program gets higher Placement? Etc. Make sure that the fee structure of your B-school is suitable for your pocket. The college should have a moderate fee structure with good placement that can assure better career prospects. So, it will be better to compare the fee structures of different B-schools before finalizing your MBA admission decision. Make sure to consider the size of a B-school’s network while applying to a B-school. The student community is an important factor it will be a part of your life, which can actually make or break your experience and will serve as the part of the network you will make. Be sure that you feel comfortable around these students. Curriculum of B-schools vary a lot depending on different universities. Think of your learning approach while checking the curriculum of a particular college. Dwell on your learning style and what you want to get out of the program to pick the best curriculum for you. One of the most crucial factors to see is checking what programs are offered by the b school that you are applying to. If you are interested in a particular specialization, for example, MBA International Business and the B-school do not offer specialization in it, there is no point in opting for the said MBA College. Good infrastructure is critical to offer a good learning environment. In fact, many renowned colleges in Greater Noida do not have their own campuses and are operating from small hired campuses with no hostel accommodation. Poor infrastructure will make you feel uncomfortable and will hinder your concentration as well. Therefore it’s necessary that the B-school has good, well-equipped classrooms, auditorium, residential accommodation, a library for the students on campus so that they can make the best use of the library, labs etc. The better is the teacher-student ratio; the better will be the guidance at the institute. The learning experience in imparting the education at the institute depends on the core faculty of the B-school. If there are lesser good faculty members and the ratio does not remain good enough, your learning experience at the B-school may get affected adversely. Education is getting costlier day by day, and hence it’s better to check the scholarship prospects of your B-school. Students should make enquirers about funding options. Scholarships make it easier to study and moreover it boosts the confidence. Bank loans along with scholarship scheme make even the costly programmers affordable for the students. What Do We Have To Study In BCA?